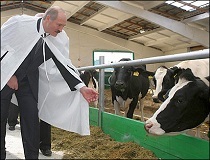 On 17 September, Alexander Lukashenka publicly explained to Vladimir Putin the process of milk production and to Nursultan Nazarbayev the functioning of the market economy. In this way the Belarusian state leader responded to critics who have questioned the quality of Belarusian milk. Milk in Belarus plays a significant role in the economy, as the country ranks at 5th in the world milk market, and the President's Property Administration owns several dairy plants. Despite the large scale of production, Belarus exports milk mainly to Russia thus rendering Belarus's position vulnerable to pressure. Moreover, Russian businessmen remain eager to privatise some Belarusian dairy factories. Belarus tries to enter the European Union and other markets, but it still has problems with obtaining the necessary quality certificates. It seems that nowhere else in the world do government elites have such close connections to the dairy industry as they do in Belarus. The President's Property Administration owns the largest Belarusian agricultural complex "Machulishchy," which is the biggest milk producer in Eastern Europe. The rapid growth of the agricultural complex began in 2013, when Viktar Sheiman, often called the last soldier of Lukashenka, became the head of the President's Property Administration, the biggest state-owned business empire and the financial backbone of Lukashenka's regime. According to estimates of the Belarusian web-site Ej.by, the Machulishchy conglomerate now produces more than 300 thousand tonnes of milk a year. This is twice the amount produced by the main producer in the Russian market, and three times the amount of the main producer in the Ukrainian market. The large scale of milk production in Belarus becomes more significant when considering that Belarus is a much smaller than Russia or Ukraine. Milk production remains one of the biggest priorities for agriculture. Over 10 years Belarus increased its milk production from 4 to 6.5 million tonnes, and now it ranks fifth in the global trade of milk with 4% of the market. However, the export of milk has almost only one direction, which is to Russia. Despite the traditional protectionism in agriculture, the Belarusian authorities allow businessmen to have shares in the dairy market. Currently, private entrepreneur Yauhen​ Baskin owns the largest farm for cows in Belarus. Milk producer "Savushkin pradukt" remains one of the most efficient dairy companies and remains the most trusted brand in the industry. It belongs to Alexander Mashensky, a businessman closely affiliated with the government. This shows that the Belarusian government sees a strategic development sector not only for themselves, but for the country at large. 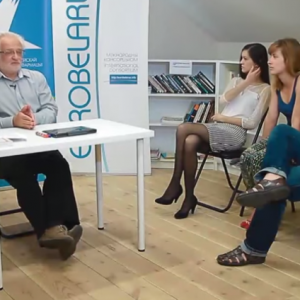 Then Alexander Lukashenkа accused Russia that it wants to privatise a number of Belarusian dairy producers. But, according to him, Lukashenka said to the Russian government "goodbye, we will die, while drinking this milk, but the Kremlin will never put the question of privatisation in this way." Later, in 2010 the Kremlin once again for a short time period imposed restrictions on the import of Belarusian dairy products. In 2014 Russian Prime Minister Dmitri Medvedev threatened Belarus with an anti-dumping investigation of potential subsidies in the dairy industry. So, milk always remains the focus of elites in Russia and Belarus. The Milk war in 2009 forced Belarusian producers to think about other possibilities for milk export. Since that time, many Belarusian entrepreneurs have attempted to acquire the appropriate quality certificates to enter the European Union market. Belarusian milk has failed to become successful in the EU market for three main reasons Firstly, the amount of bacteria and antibiotics in Belarusian raw milk remains several times higher than allowed by European standards. Secondly, EU countries have a protectionist policy in agriculture. Third, Belarusian milk lacks special features to compete with Western producers. Export possibilities of Belarusian dairy to other countries, besides the EU and the Eurasian Economic Union remain nonexistent, while New Zealand, the European Union, the United States and Australia confidently hold the lead in their markets. Thus, Belarusian milk manufacturers have problems with the stable eastern markets, but at the same time they are incapable of solving their product quality issues. This situation blocks any possibility for fully fledged cooperation with the West and other countries. Belarusian milk in many ways resembles the general trajectory of Belarusian foreign policy.